Oligotropus campanulae Robertson, 1903. Trans. Amer. Entomol. Soc. 29: 171 (♀, ♂). Oligotropus wilmingtoni Mitchell, 1924. J. Elisha Mitchell Sci. Soc. 40: 156 (♀). 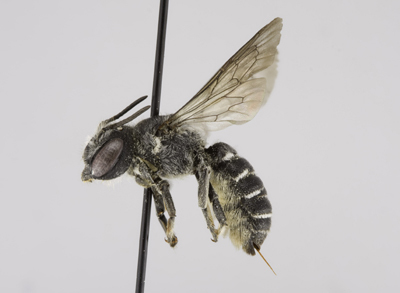 Megachile (Chelostomoides) campanulae var. wilmingtoni Mitchell, 1937. Trans. Amer. Entomol. Soc. 63: 384, 385, 391 (♀, ♂). 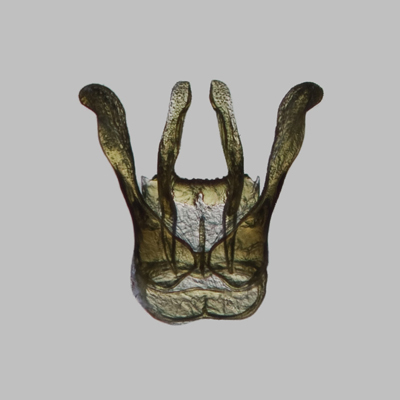 Diagnosis.The female of M. campanulae can be recognized by the combination of the parallel sided metasoma, mandibles which lack cutting edges, and by T5 entirely lacking an apical fascia. They are most similar to M. angelarum. Females of M. angelarum have a white apical fascia on T5. The male of M. campanulae can be recognized by the combination of only three visible metasomal sterna, only 4-5 punctures between lateral ocelli and edge of vertex, the front coxal spine reduced and concealed by the dense, white pubescence, and T4 and T5 with conspicuous, long and erect pale hairs. They are most similar to M. angelarum. Males of M. angeralum have 9-10 punctures between lateral ocelli and edge of vertex, a visible front coxal spine, T4 and T5 with conspicuous, very short and erect dark hairs. 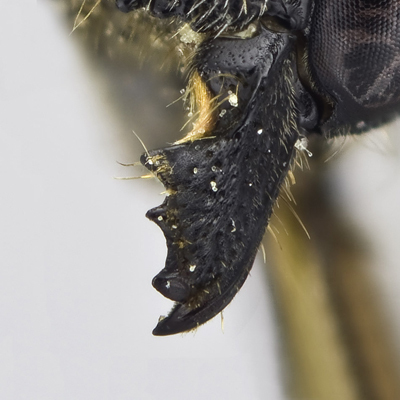 1) compound eyes subparallel to slightly converging below; lateral ocelli very slightly nearer eyes than margin of vertex (4:5), 2) clypeal margin with a pair of distinct tubercles, one on each side of midline, denticulate towards lateral margin , 3) mandibles distinctly 4-dentate, without cutting edges (Figure M4), 4) gena subequal to compound eye in width, 5) punctures of vertex coarse, deep and distinct, uniformly and slightly separated, those on gena not quite as coarse but considerably closer, frons quite coarsely and very closely punctate, fine and densely crowded on paraocular area, supraclypeal area with some narrow, shining spaces medially, but punctures coarse and deep, becoming very close laterally, clypeus very closely and coarsely punctate, becoming somewhat more finely and more obscurely so toward apical margin medially, 6) pubescence pale on head, rather short and sparse, whitish and more copious on face around antennae, on inner orbits and on gena below, becoming sparse on clypeus, gena above and on vertex where it is somewhat more yellowish, 7) F1 broader than long (2:1), about half as long as pedicel and subequal to F2, F3 quadrate, remaining flagellomeres slightly longer than broad (2:1.7), apical flagellomere more elongate (3:2). 1) pubescence short, sparse and entirely white laterally and posteriorly, quite dense around pronotal lobes, very short, sparse and entirely pale on mesoscutum, whitish and somewhat more erect and elongate on scutellum, 2) mesoscutum and scutellum coarsely, deeply and closely punctate throughout, interspaces very narrow but shining, finer and very close on axilla; pleura somewhat shining between coarse, deep punctures, these becoming densely crowded anteriorly; lateral faces of propodeum somewhat smoother but dull, with very close, fine, shallow punctures, face of triangle more velvety, punctures very shallow, sparse and irregular, 3) all basitarsi somewhat narrower and shorter than their tibiae, spurs yellow, 4) tegula minutely and closely punctate, 5) wings hyaline basally, becoming faintly clouded apically, veins black. 1) elongate and parallel-sided, T2-T4 with deep, transverse, basal grooves, filled to a considerable degree with white tomentum, basal margins distinctly and sharply carinate, apical margins depressed at extreme sides but not medially, the apical, white fasciae evident only toward extreme sides, T4 with apical fascia complete but rather narrow medially; T1 with rather sparse, erect, pale pubescence, lateral angles densely white tomentose; discal pubescence of the T2-T5 extremely sparse, entirely pale, hardly evident; T5 faintly grooved toward base but basal margin not at all distinct, apical margin depressed only toward sides and entirely lacking the apical fascia; punctures quite deep and distinct, variable in size and spacing, rather coarse and sparse medially on each tergum, becoming somewhat closer laterally and toward apical margin, quite fine and close over most of T1, rather uniformly coarse and close on T5; T6 nearly straight in profile, with an abrupt, apical lip, largely covered with pale, subappressed hairs which obscure the surface, 2) S6 covered with short scopal hairs that are pale toward base but become darker toward apex; scopal hairs otherwise yellowish-white, the sterna rather uniformly, closely, deeply and rather coarsely punctate, apical margins narrowly depressed and very narrowly hyaline. 1) compound eyes very slightly convergent below; lateral ocelli subequally distant from eyes and margin of vertex, 2) clypeal margin with two robust tubercles on each side of mid-line; punctures of clypeus very coarse and contiguous, becoming somewhat finer toward apical margin, 3) mandibles 3-dentate, lower process broadly triangular, median in position, 4) gena slightly narrower than compound eye (5:7), shallowly excavated just below base of mandible, 5) vertex shining, punctures coarse, deep and rather sparse, interspaces of one to slightly less than 1 pd (with 4-5 punctures between lateral ocelli and edge of vertex), becoming slightly finer and closer on gena; frons coarsely and very closely and deeply punctate, becoming finely rugose laterally and over supraclypeal area, 6) pubescence of head entirely pale; rather short and sparse on gena and vertex, becoming quite copious and plumose around antennae and over lower part of face, largely hiding surface, longer still on gena below, very dense and shorter on lower surface on mandible and lower process, 7) F1 broader than long (2:1), about half as long as pedicel, and 1/3 as long as remaining flagellomeres which are longer than broad (1.5:2), apical flagellomere more elongate (2:1). 1) pubescence rather short, sparse, entirely white laterally and posteriorly, quite dense around pronotal lobes, very short and sparse on mesoscutum, becoming somewhat more erect and elongate on scutellum, 2) punctures of mesoscutum coarse, deep and close, slightly separated over most of surface, but interspaces very much narrower than diameter of punctures, those on scutellum somewhat more separated, interspaces equaling 1 pd, but fine and very close on axilla; pleura somewhat shining below between coarse and deep punctures, these becoming finer and closer above; propodeum laterally somewhat smoother but with very fine, shallow and close punctures, face of triangle somewhat more velvety, punctures more minute, sparse and vague, 3) front coxal spine reduced to a very obscure, blunt tubercle, coxa densely white pubescent; front tarsus entirely dark, tarsomeres 1-3 slightly dilated and slightly concave but barely excavated below, with some elongate, brownish hairs along anterior margin, but the usual posterior fringe completely lacking, a long cluster of intertwined setae at base of posterior margin of basitarsus; mid tibial spur well developed; mid and hind tarsi slender and simple, spurs yellow, 4) tegula minutely and closely punctate, 5) wings subhyaline basally, becoming faintly clouded apically, veins black. 1) T2-T5 deeply grooved across base, and with white fasciae, basal margins quite distinctly carinate, apical margins yellowish-hyaline, quite deeply depressed laterally but only slightly so medially, T1-T3 with apical, white fasciae evident only toward sides; T1 with rather copious, elongate, white pubescence, discal pubescence of T2 and T3 very sparse, short and obscure, hardly evident, entirely pale, that of T4 and T5 more conspicuous, longer and erect, and pale; punctures deep, distinct and rather coarse, rather uniformly separated, interspaces not much exceeding 1 pd, these slightly coarser at extreme sides than in centre, T1 and T5 more finely and closely punctate, T6 with smaller punctures with no interspaces, especially medially; T6 vertical, with a rather dense, basal, white fascia, otherwise quite densely covered with short, suberect, pale tomentum that darkens medially, with a few more elongate, blackish hairs, carina obscure, with a rounded median emargination, elevated but very slightly on each side above surface of tergum, median teeth of apical margin broadly carinate and very low, largely obscured by dense, white tomentum, very much nearer the acute, lateral teeth than to each other; T7 transverse, not at all produced medially, 2) S1-S3 exposed, S4 retracted, entirely hidden but unmodified; sterna quite closely and deeply punctate throughout, S2 and S3 somewhat swollen on each extreme side, apical margins depressed and densely long, white pubescent. This species is a cavity nester and can be trap-nested (Baker et al. 1985) (Table 1). Like other members of the subgenus it collects resins and gums for nest construction (Medler 1966), and thus lacks the cutting edges between the mandibular teeth (Michener 1962). Immature stages and nest structure were illustrated by Baker et al. 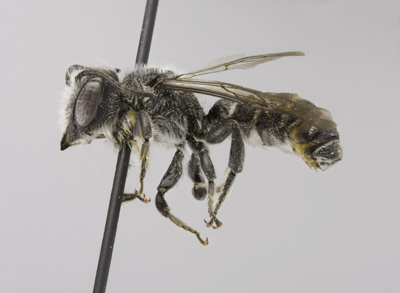 (1985), who also found the cletoparasitic bee Stelis (Dolichostelis) louisae Cockerell in its nests. This cleptoparasite species is known to be associated with the subgenus Chelostomoides (Parker and Bohart 1979). 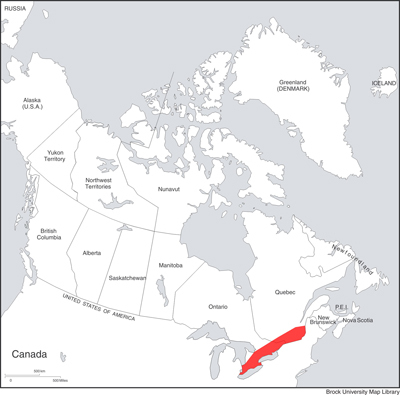 Southern QC and ON (see Map 4).